Lyophilized products are becoming more significant in the pharmaceutical and biopharmaceutical industries. Lyophilization technologies and manufacturing processes are being increasingly used by pharmaceutical companies to produce a final dosage form that has improved stability, a longer shelf life and fewer limitations on storage and transportation. According to reports, biopharmaceuticals account for 40% or more of the R&D and revenue of the pharmaceutical industry. It is necessary to lyophilize approximately 60% of biopharmaceuticals such as proteins, enzymes, and monoclonal antibodies in order to improve their stability for ready-to-use solution dosage forms. To determine the integrity of biopharmaceutical lyophilized cakes Micromeritics offers a number of tools, such as the TriStar II Surface Area Analyzer, AccuPyc II 1340 Gas Displacement Pycnometer, and the AutoPore® IV Mercury Porosimeter. During production it is essential to closely control the structure of the cake, including its surface area, pore size, total pore volume and density. The lyophilized cake’s physical and chemical properties will be affected by changes in production conditions including primary drying temperature, secondary drying temperature and freeze temperature. The release or approval of a batch is based on three characteristics: appearance, surface area and thermal properties. Visual inspection as well as more quantitative analysis of lyophilized cakes can be performed with BET surface area analysis, gas pycnometry and mercury intrusion porosimetry. Mercury intrusion porosimetry is capable of providing data on the internal cake structure. The cake’s integrity and its reconstitution properties are directly influenced by total pore volume and pore size distribution. The degree of shrinkage of the cake during freeze-drying and therefore the dried cake’s final pore size can be determined from the correlation of pore size to surface area data. 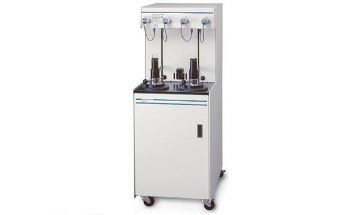 Micromeritics’ TriStar II (Figure 1) is a fully automated, three-station analyzer using static gas adsorption, an established technique. The analyzer can increase both the efficiency and speed of quality control analyses with the right resolution, accuracy and data reduction features to satisfy most R&D and manufacturing requirements. BET surface area data provided by the TriStar II can be used to determine the effect of freeze-drying variations and improve process control steps to avoid cake collapse. Micromeritics’ AutoPore IV mercury porosimeter (Figure 2) determines density, percent porosity, pore size distribution, total pore volume and compaction/compression using mercury intrusion and extrusion. Extremely high-resolution data is acquired by the instrument. To improve sample throughput it is possible to equip the analyzer with either one high-pressure station and two low-pressure stations or two high-pressure stations and four low-pressure stations. 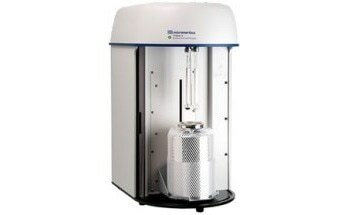 The AccuPyc II uses Helium pycnometry to reliably determine the true density of a sample and can be used for powders, solids and slurries. The instrument yields high-speed and high-precision volume measurements. This information has been sourced, reviewed and adapted from materials provided by Micromeritics Instrument Corporation. 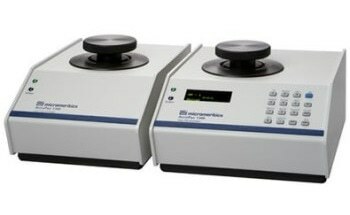 For more information on this source, please visit Micromeritics Instrument Corporation.